P2P Music Jukebox is an all-in-one music tool that helps you do everything you ever wanted with your music. It burns custom audio and data CDs from MP3s, WAVs and WMAs, records audio CDs into MP3s and WAVs, play MP3, CD, WMA, and WAV, converts music from and to MP3s, MP3 VBR, WMAs and WAVs, organizes your entire music collection, helps you discover online music downloads with peer to peer file sharing tools, edit ID3 tags, CDDB support and more. Pentium processor 266 MHz minimum, 64 MB RAM minimum, 10 MB harddisk space. Moderal Jukebox, the best way to store, search and sort your music. The JukeBox'er - the ultimate home jukebox system. 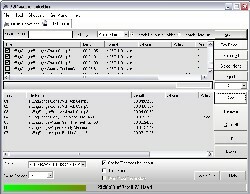 MP3 player and CD Ripper. Qweas is providing links to P2P Music Jukebox 1.0.0 as a courtesy, and makes no representations regarding P2P Music Jukebox or any other applications or any information related thereto. Any questions, complaints or claims regarding this application P2P Music Jukebox 1.0.0 must be directed to the appropriate software vendor. You may click the publisher link of P2P Music Jukebox on the top of this page to get more details about the vendor.